As undergraduates, Pooja Sandesara (left) and Adrienne Welsh worked 15 to 20 hours a week in Radhika Atit's laboratory. Even before she joined the biology faculty in 2005, Radhika Atit had ambitious plans for the undergraduates who would be doing research in her lab. Quite simply, she wanted to offer them graduate-level training. Atit's students would be responsible for independent projects. They would learn advanced techniques while developing their critical thinking, problem solving and presentation skills. They would collaborate with other members of her team and publish their findings in peer-reviewed journals. Once Atit accepted a position at Case Western Reserve, she soon realized that this was a place where her ambitions were attainable. The university has a long tradition of fostering and honoring undergraduate research. 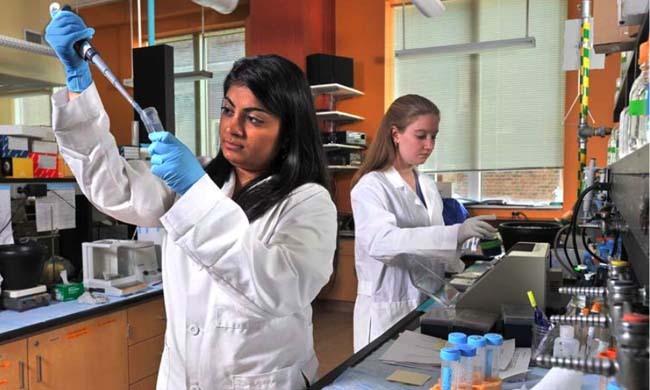 In the natural sciences especially, students benefit from an extraordinary range of opportunities—not only within the college, but also at the Case Western Reserve School of Medicine and at nearby institutions such as Cleveland Clinic and the Cleveland Museum of Natural History. Through SOURCE (Support of Undergraduate Research and Creative Endeavors), the provost's office awards travel funds to students presenting at scientific conferences, provides summer research stipends and organizes an annual symposium to highlight student work. In a setting where undergraduates have so many options, one might think that a new faculty member would have trouble recruiting students. But this hasn’t been a problem for Atit. Because undergraduate research is part of the culture, students who might not otherwise consider working in a lab are motivated to do so. As Preethi Mani, one of Atit's first hires, puts it, "I came in with no background in research, but it was something that I thought would be interesting. And since I was at a university with so many opportunities, I wanted to take advantage of what was in front of me." Mani was still a first-year student when she entered Atit's start-up lab in spring 2005. Initially, she thought she might be washing bottles or preparing solutions. But she soon discovered that Atit had higher expectations than that. Under her mentor's guidance, Mani began reading textbooks on developmental biology and genetics. Then she delved into the literature in Atit’s field of research—embryonic cell development. Much high-profile science in recent years has focused on the process by which embryonic stem cells differentiate into muscle cells, bone cells, and so on. In the course of her postdoctoral studies, Atit became interested in the development of dermal cells, which make up the layer of skin beneath the epidermis. The dermis is "the living part of the skin," Atit explains, and the structures it houses (such as sweat glands) perform many of the skin’s essential functions: sensing pressure and pain, maintaining body temperature, preventing fluid loss. Atit completed part of her postdoctoral work in the Department of Genetics in the Case Western Reserve School of Medicine. There, she began using state-of-the-art genetic tools to look for molecular signals guiding dermal cell development in a mammalian model—the mouse embryo. Atit is excited by the potential clinical applications of her work. By discovering how stem cells become dermal cells, she hopes to make possible the creation of tissue-engineered, functional dermis for patients with burns or congenital skin defects. Over the past four years, undergraduates have contributed significantly to this effort. Atit credits one team of students, led by Jennifer Ohtola, with discovering a signaling pathway critical to early dermal cell identity in the belly area of the mouse. Other students, including Mani, have joined Atit in examining the formation of dermal cells in the head and face. This research attracted major support from the National Institutes of Health, which awarded Atit a five-year, $1.6 million grant in 2007. And it wasn't long before the students began winning recognition in their own right. In 2006, Mani took first prize at the SOURCE symposium, and Pooja Sandesara received an honorable mention in 2008. Two years ago, Ohtola won the Michelson-Morley Award from the biology department. Both she and Sandesara have also received SOURCE summer research stipends. Finally, last spring, Mani was one of 41 students selected by the national Council on Undergraduate Research to present their work to members of Congress. With SOURCE funding, Mani traveled to Washington, D.C., where she met with Ohio Senators Sherrod Brown and George Voinovich and with Representative Steve LaTourette. The meetings were intended to bolster support for undergraduate research. "I didn’t explicitly lobby," Mani says. "But I hoped to show that the research done by undergraduates is significant enough, and has enough promise, that the funding should continue." Even as her research team expanded, Atit kept to the same mentoring style she had adopted with Mani. She continues to hold weekly one-on-one meetings with her undergraduates to discuss the scientific literature, formulate research questions and help them develop their projects. 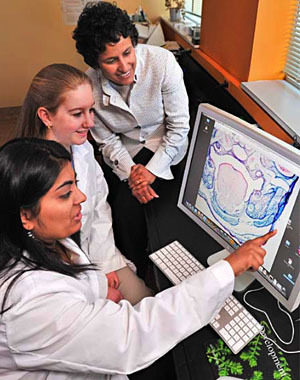 From left: Pooja Sandesara, Adrienne Welsh and Radhika Atit examine data from their research into embryonic skin development. "Dr. Atit did a really good job of introducing us to how to think about the subject," says Adrienne Welsh, who joined the lab as a sophomore in 2006. "We weren't going to come up with an original project completely on our own. So she walked us through it, asking questions, and moved us to the point where we could start suggesting experiments. And she continued to guide us from there, until we had enough knowledge that we could start to think like scientists on our own." Enabling undergraduates to work through problems for themselves is at the heart of Atit's approach. Yet it isn't as if she disappears from the scene once they begin their research. "We spend a lot of time side by side," Atit explains. "We talk about experimental design, interpretation, how to present the data, how to make figures for posters or talks or publications." Perhaps most important, they often sit at a dual-head microscope and look together at the raw data— slides of developing cells—from the students' projects. Sandesara recalls one such session at the microscope. For her senior project, she had "ramped up" the signaling process in a sample of embryonic tissue, hoping to increase the production of dermis. One day last December, she and Atit were peering into their separate eyepieces, looking for evidence that the experiment had worked. On one slide, Atit suddenly noticed a profusion of dermal cells. "It was a very cool moment," Sandesara says. "To get that exact output was pretty wild." She could imagine future scientists applying her technique to adult stem cells harvested from a patient's bone marrow, and then providing that patient with a fully functioning skin implant. The two researchers celebrated with a hug. Atit's students acknowledge that dramatic breakthroughs aren't a daily occurrence. They recall experiments that didn't work out—the lost time and the wasted slides. They cite projects that looked straightforward at first but then required a change of direction. Yet the unpredictable nature of the work is one of the things they most value about it. In laboratory courses, Welsh explains, undergraduates don't get to see a project through from start to finish. When they conduct an experiment, the professor and the teaching assistant know ahead of time what the results will be and how to interpret them. But in an actual research setting, the process of inquiry is open-ended. The students also say that their lab experience has taught them important life skills. As Welsh puts it, bench science requires "a whole new level of time management, organization and communication." For example, the undergraduates work 15 to 20 hours a week while carrying full course loads. If they have an exam on a day when they were planning to do a dissection, they must be able to hand the task off to someone else. This requires advance planning and a project organized with such care that other people can make sense of it. "Everyone has to be on the same page," Sandesara explains. "You can’t just have your own little system going on." This past spring, Welsh completed her senior research project and successfully defended it before a faculty committee. As a result, she became the first student from Atit's lab to graduate with honors in biology. Both she and Sandesara received their diplomas in May, and both, like all of Atit's students so far, are headed for medical careers. But while Welsh will attend the Case Western Reserve School of Medicine this fall, Sandesara has decided to work in Atit's lab for another year. With their medical school applications, they each enclosed publications that Atit says would be worthy of a doctoral researcher. Meanwhile, Mani is beginning her second year at the Cleveland Clinic Lerner College of Medicine of Case Western Reserve University. The program includes two summers of basic and clinical science research as well as an entire year of thesis-level research. The goal, Mani says, is to produce "not only practicing physicians, but also people who engage in the research world." Mani credits her experience in Atit's lab with motivating her to enter that world. "It really shaped me," she says.